Price Fishback presented comparisons on welfare systems in the U.S. and the Nordic countries. 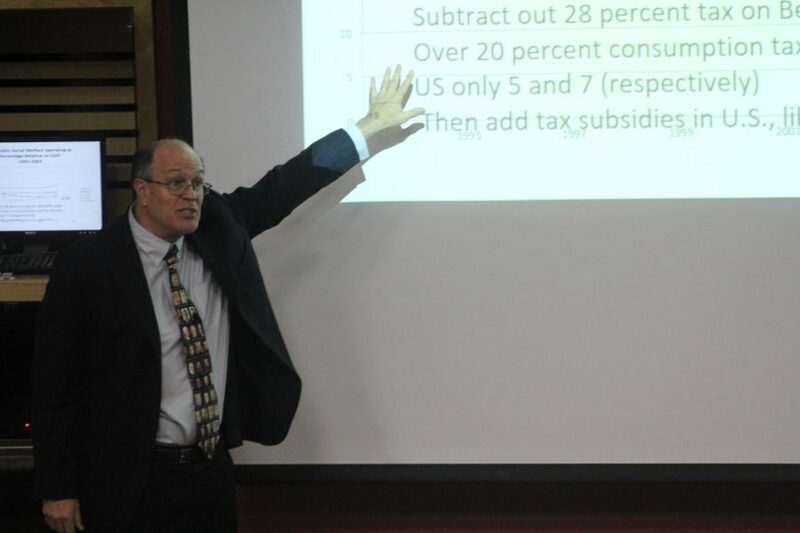 Professor of economics at the University of Arizona Price Fishback presented the annual Phi Beta Kappa Visiting Scholar lecture titled “The Long Term Trends in Social Welfare Spending in the United States and Nordic Countries” in Valders 206 on Nov. 16. Fishback’s research is focused on early 20th century coal miner’s social welfare spending. More recently, Fishback has been studying and comparing social welfare spending in the Nordic countries — Sweden, Denmark, Finland, and Norway — compared to the United States. During her introductory remarks at the lecture, Professor of English Kate Narveson explained that most people tend to think that social welfare is better in Europe and the Nordic countries than in the U.S. However, she thought that Fishback would challenge this idea with his lecture. Fishback started the lecture by talking about measuring the rise in social welfare spending in the 20th century in the U.S. According to Fishback, the rise of the “welfare state” could be more accurately described as the rise of the “social insurance state.” Social insurance is the process of the government providing welfare for people. Fishback highlighted that there are huge variations within the U.S. as laws change from state to state. Fishback also highlighted that Nordic countries can be as big as a single U.S. state. He then proceeded to compare social expenditures such as old-age pensions, survivor benefits (not private life insurance) Incapacity-related aid, health expenditures, aid to families, unemployment benefits, income maintenance, job training by the government, and housing subsidies in the U.S. and Nordic countries. Fishback emphasized that many of the social welfare comparisons are done using the gross government social expenditures as share of gross domestic product (GDP). Fishback argued that those statistics forget to take into account different factors like taxation, subsidies, and levels of spending in purchasing power parity (PPP) dollars. When all the data is fixed, the U.S. raises above the Nordic countries in terms of social expenditures compared to GDP. Halfway through the lecture, Fishback asked the audience to talk to their neighbors about when they thought the U.S. started providing social welfare. The options he gave were before the 1800s (colonial period), between the 1800s and early 1900s, or starting in 1933 with the New Deal. Fishback ended the lecture by highlighting another alternative seen in countries like New Zealand and Chile. These countries are moving to a private system of social security returns instead of having public accounts. After the lecture, Fishback held a Q&A session where further discussion of the topics was encouraged.